Brides interested in unique jewelry often choose two tone engagement rings for their unusual beauty and contrasting metals. Many different metals can be used to create two tone rings, from silver, platinum, and titanium to various shades of gold including white, yellow, sage, and rose. With a wide range of colors and designs to choose from, there is a tone tone ring perfect for every bride. Click on 'buy now' on any of the following ring photos for retail information. Using colorless diamonds channel set in white gold to contrast with a solitaire set in yellow gold gives a ring both classic and modern appeal. Because the band is thin and has space incorporated into the design, this is a delicate ring perfect for thin, petite fingers. Heart shaped engagement rings often incorporate contrasting metals with a dual heart design using different metals for each heart. This represents the two individuals involved in the relationship, and the hearts bind them together in love. 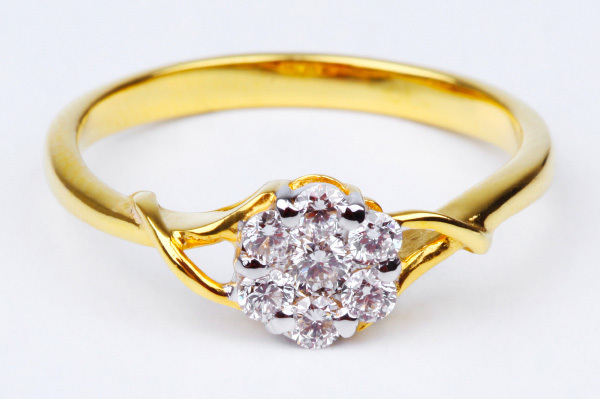 This can be a beautiful engagement ring and is equally popular as a promise ring. Boldly tinted metals or unusual choices such as rose gold or copper give an engagement ring an unusual, striking design. This configuration highlights both the unique color and the ring's center stone, bringing a modern touch to a classic romantic symbol. Two tone rings are popular for wedding sets, and contrasting white and yellow gold is perfect for either the bride or the groom. Wide swaths of color give the rings a bold appearance, yet the matching bands help cement the couple's commitment. An engagement ring with a split shank may not have much room for two tone embellishments, but a contrasting twist of a different metal within the design enhances the focal point of the central diamond. This also helps give the illusion of a larger stone. A contrasting metal inset can be made less stark and more delicate if it is paved with diamond chips or accent stones. This also gives the overall ring more sparkle and brilliance, and the pave stones help highlight the unusual inset metal. Two tone engagement rings can highlight small ring design details, such as open filigree patterns. Two tone metals are also popular for other highly detailed rings, such as Celtic knotwork patterns or geometric etchings, since the contrasting metals will highlight those patterns. A two tone ring does not need to use equal amounts of both metals for a lovely design. A vintage double halo look set in white gold with rose gold accents gives just the right hint of modernity without sacrificing style or beauty. This also leaves the option for a thin rose gold wedding band. For a private, romantic touch, consider two tone engagement rings that use contrasting metals for a hidden message, such as a rose gold hearts or initials in the setting of a white gold ring. This is an unusual but clever way to incorporate multiple metals into a ring in a personalized way. The easiest way to create a two tone engagement ring with a simple diamond solitaire is to use contrasting metals for the ring's band and a collar or frame for the stone. This gives the stone an offset, highlighted look without unnecessary clutter or distracting accents. If you like contrasting metals but want an even more colorful engagement ring, consider a contrasting setting and colored gemstone center stone. This adds a brilliant burst of color to the ring in a unique and exciting way, while still enjoying the beauty of different precious metals.